BERKELEY — Renowned jazz drummer Akira Tana and acclaimed Hawaiian musician Bruce Hamada, along with legendary bass guitarist Tony Saunders and vocalist Misa Malone, will headline the entertainment at the 64th annual Satsuki Bazaar and Arts Festival at Berkeley Buddhist Temple. The two-day event, which is the major fundraiser for the temple, will be held from 3 to 9 p.m. on Saturday, May 18, and from 12 noon to 7 p.m. on Sunday, May 19. The temple is located at 2121 Channing Way. The entertainment on Sunday, which will be free, will also feature the Academy of Hawaiian Arts ensemble. Returning as host of the event will be Josef Anolin, an Oakland native and up-and-coming stand-up comedian. The bazaar will feature a variety of Japanese, Hawaiian and Asian foods, including sushi, udon, loco moco, kalua pork, curry rice, and shave ice as well as American fare such as hot dogs, barbecued steaks, hamburgers and portobello mushroom burgers. The event will also feature a silent auction, arts and crafts, games for children, homemade baked goods, and Buddhist literature. A portion of the proceeds will go to benefit Friends of Disabled Children Inc. of El Sobrante. Parking is available at the nearby Brower Center lot on Kittridge Street between Oxford Street and Shattuck Avenue and the UC Berkeley lot at Bancroft Avenue, Fulton Street and Durant Avenue. The temple is located five blocks south of the Downtown Berkeley BART Station. 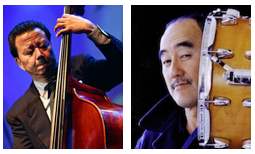 3 p.m.: Acclaimed jazz bassist and singer Bruce Hamada of Hawaii will perform with renowned jazz drummer Akira Tana. Hamada performed for more than 20 years at the Halekulani Hotel Lewer’s Lounge in Honolulu. He has performed with the Honolulu Symphony and has worked with such artists as Rosemary Clooney, Michael McDonald, Bernadette Peters and Michael Feinstein. He has been part of the opening act for Diana Krall in Honolulu and has toured throughout Japan several times. Tana, son of the late Berkeley Buddhist Temple minister Rev. Daisho Tana, has established himself as one of the most sought-after drummers on the international jazz scene. He has performed with Lena Horne, The Manhattan Transfer, Leonard Bernstein, and Seiji Ozawa, among many others, with performances on more than 100 recordings. 1:45 p.m.: Tony Saunders is one of the nation’s top bass guitarists and has performed in the genres of jazz, gospel and world music. He is a composer, arranger, music producer and the head of his own studio, Y-Not Muzik. Saunders has performed and recorded with some of the world’s greatest musicians, including Eric Clapton, Jerry Garcia, Stevie Wonder and David Crosby. 12:30 p.m.: ‘AHAmele is the music ensemble from the Academy of Hawaiian Arts in Oakland. It incorporates upbeat strums, ipu drum rhythms, ukulele picking, sweet vocal harmonies and singing parts to arrangements of Hawaiian-language songs to make its unique sound. The ensemble regularly performs at festivals and other community events. The keiki hula (children) will be performing with the ensemble.